for 4 nights accommodation.. 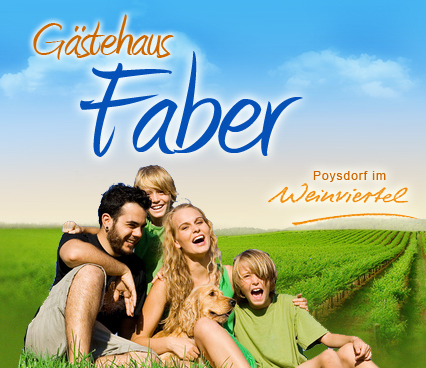 Welcome in the house of Faber! Our house is located on the outskirts of Poysdorf, in a beautiful and quiet area, located near the pond, church of Maria Bründl all surrounded by romantic Vineyard. Two kilometers from the house there is a golf field, with a restaurant, shop, equipment rental and the SPA. 50 km from the house is copy of Schonbrunn castle - Schloss Hoff, This is the second of the largest castle in Austria. Poysdorf is famous by vineyards and cellars for the production wines, champagnes, vodka. There is also a museum where you can see the whole production process, and try these great drinks. Our house is a place, where you can enjoy agro life. Our house don't have stars like a hotel, but have "soul and heart". We are waiting for your visit, and we wish you have a good time in Poysdorf! Current events in Poysdorf here.